This concert celebrates Opera Fuoco’s latest recoding and featuring three former members of Opera Fuoco’s Young Artists Studio and the Opera Fuoco orchestra conducted by David Stern. 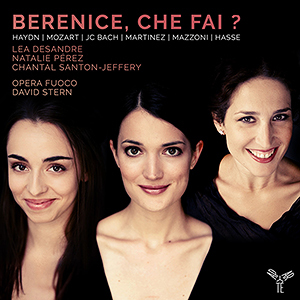 Berenice is a compilation of late baroque and early Classical works based principally on Metastasio’s famous 18th-century opera scene « Ah Berenice » from his opera Antigono. Not only was the scene set to music by such composers as Haydn and Hasse, but also by Antonio Maria Mazzoni and Marianna Martinez, a composer of Spanish descent who was widely connected to the Viennese music scene and, for a time, lived in the same noble house as Metastasio and Haydn at Grosse Michelstrasse. The young Mozart’s concert aria « Berenice » and Johann Christian Bach’s aria « Confusa, smarrita» from the composer’s lost pasticcio opera, Berenice, as well as Hasse’s Antigono overture complement the program.